I was tagged by Marie, author of Estycare, to do this post, so here goes… I’m supposed to pick a favorite item (or two!) for each color of the rainbow, plus pink and multicolor. I don’t have all of my makeup collection with me at the moment (I left a bunch of stuff at school for the summer), but here’s what I came up with! 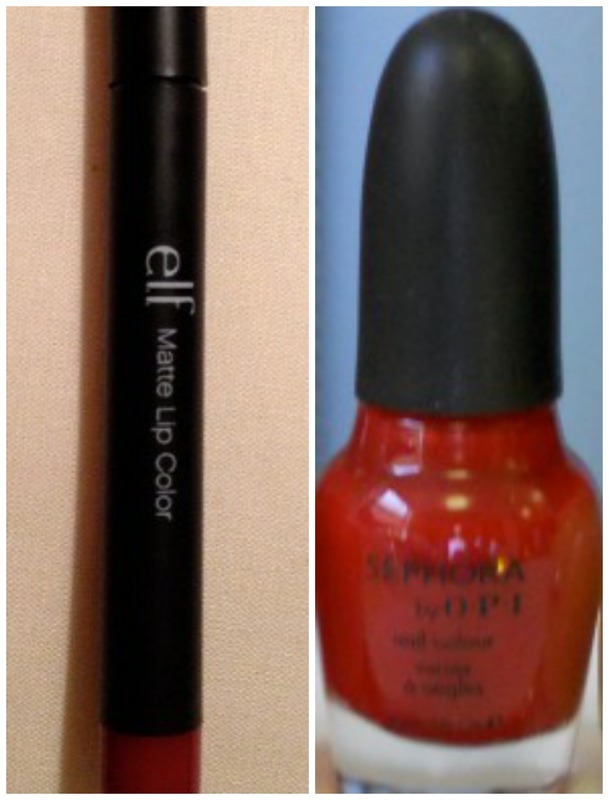 ELF Matte Lip Color in Rich Red – this is my easiest full-color red lip product. I used it a couple times and let it sit around for a while but lately I’ve tried it again and I have no idea why I ever put it away. Don’t you just love when that happens? It’s like you bought new makeup without spending the money. Anyway, I really love it, but as you can see in the photo, the packaging bent somehow. Sometimes the product falls out of the tube, too. But it’s so cheap that I don’t mind that, and I wouldn’t be heartbroken if I had to replace it. Sephora for OPI in Personal Shopper – I bought this back in high school and the color made me feel so pretty and mature. I felt super awkward back then (braces for 4 years, glasses, generally looking much younger than I was) so it was a huge confidence boost at a time I was “reinventing” myself. But aside from the sentimental value, it’s a beautiful red and goes on great! Apologies for the blurry photo, by the way, it’s not with me at the moment and I searched my computer for any photo I had of it. Covergirl Lash Blast Mascara – I don’t like to throw around the word “favorite” unless it’s tied to a period of time (like monthly favorites ;)), but this is one mascara that I keep going back to. If you somehow haven’t tried this, it has a medium-sized wand with short rubber bristles. With one coat it adds volume and a little length, and it holds a curl decently, which is all I need day-to-day. Revlon Just Bitten Kissable Balm Stain in Rendezvous – I was a bit nervous when I bought this, but I’m so glad I did! I love these balm stains in general, I think I own five now. What I love most about them is that they’re buildable (so you don’t have to look like a Cheeto if you don’t want to), and that you can reapply it throughout the day with no problem. This color in particular is very flattering and can really brighten up any look. I love wearing it on rainy days in Pittsburgh when everything is grey. 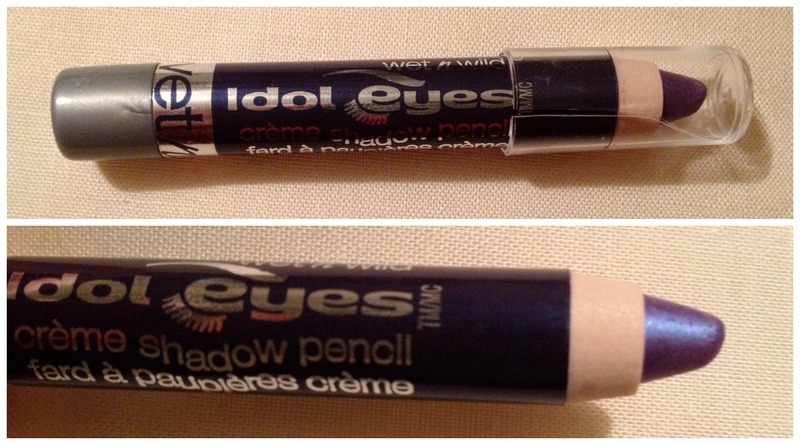 Maybelline Color Tattoo in Shady Shores – This is the only yellow makeup item I could find! I really wanted to talk about at least one Color Tattoo here because they are the best drugstore cream shadow you can find, hands down. I love this one because it’s one of the duochromes from the recent limited edition line. It has a yellow base with green and silver shimmer. It goes on a bit light but that makes it perfect for layering! I have some yellow-ish powder eyeshadows back at school so I’m looking forward to trying them out with this. In the meantime, it looks great over white (I use the NYX jumbo pencil in Milk). TheBalm Time Balm White Tea Cucumber Face Toner – I bought this toner for half off when TheBalm had a big sale a few months back. I’ve been using it during the summer twice a day, and it’s super refreshing! It doesn’t dry out my skin at all, and feels nice and cool on my skin. I really can’t imagine my mornings without it at this point because it’s so relaxing (I’m not sure how much it does for my skin as a “toner,” but that’s a whole different story). Clinique Age Defense BB Cream in Shade 02 – This is a great BB cream. The color matches well, and it does a great job evening out my skintone when I don’t want a full foundation. My only qualms with it are that it’s not very easy to spread on the skin, and there isn’t a great selection of shades. But this tube has lasted me over a year and it’s still going strong, so I think it’s still worth the money. Garnier The Radiance Renewer Cleansing Gelee – I’ve been using this face wash for a couple weeks now and I really like it, alone or with my Clarisonic. I may write a full review on it at some point, once I’ve used it more and can really see if it has any effect on my skin. Sigma Brushes (Mrs. Bunny collection) – I got this Sigma set for Christmas last year and I’m sold. These brushes are so soft, yet they’re sturdy. I’m pretty rough with them when I clean them, and I’ve never had any shedding. They also foam up really well when you’re washing them, so I really feel like I’m getting a deep clean. They apply makeup so well, and now I can’t imagine getting ready in the morning without them! Wet ‘n Wild Eyeshadow Palette in Blue Had Me At Hello – I love these eyeshadows in general, but this palette is great because it has a wide range of blues. I honestly don’t get much use out of the lightest shades, but I love the middle four colors. They are so pigmented and just beautiful. OK, I cheated and put 3 things here. Clarisonic Mia – Love, love, love this. I wrote about it in my Permanent Favorites post. Benefit Erase Paste – This was in one of my favorites posts recently, so I won’t repeat myself too much here. Basically, it’s a salmon-toned brightening concealer and it does a good job concealing my awful dark circles (seriously, it looks like I got punched in the face…twice). Revlon Super Lustrous Lipstick in Berry Couture – normally I hate how sheer these lipsticks are, but for this color I like that it’s light. I got this a few days ago and have already worn it twice. It’s a “neutral” way to wear a purple lip. I wish the color could be built up more, but I don’t mind layering it with brighter lipsticks for a little more color (it looks nice over the Maybelline Vivid in Brazen Berry). TheBalm blush in Down Boy – I’ve written about this before, and I’ll probably keep writing about it. It’s a mostly-matte cool pink that works for every look, every season. I wish it lasted a teensy bit longer through the day, but I really can’t complain, considering I got it half off on Hautelook. Milani Shadow Eyez in Champagne Toast – This is a beautiful metallic light pink that I use as a base for a lot of neutral eye looks. It lasts a long time and is super quick to apply. 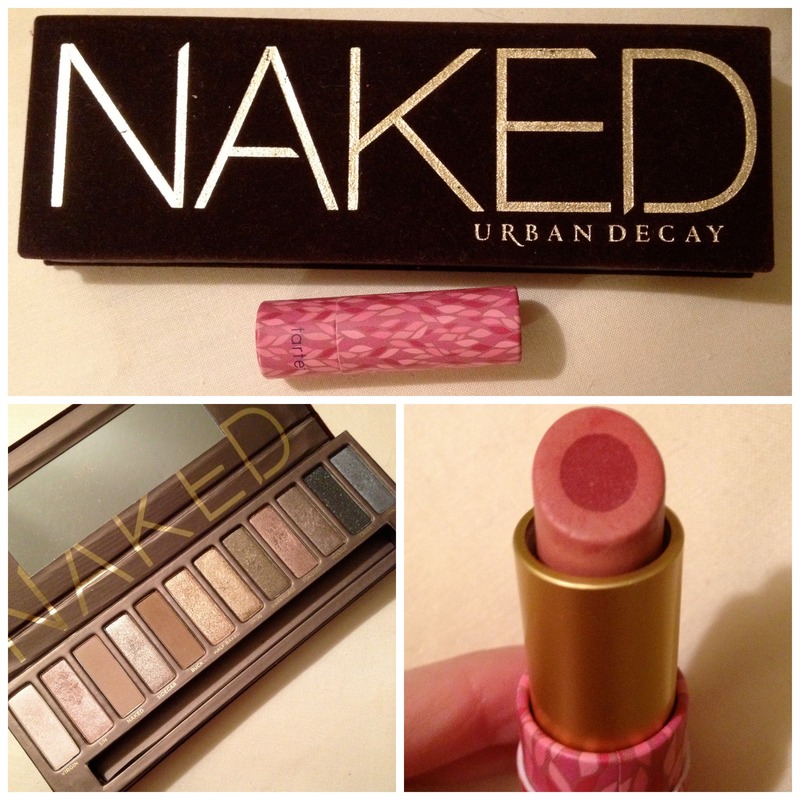 Urban Decay Naked Palette – I got this from my sister a few months ago and it still looks like new. I used it a lot when I got it but eventually not as much as I bought and tried out more eyeshadows. I pulled it back out this past week and I’m addicted all over again. I definitely need a primer with these shadows, but they’re so pretty. This palette is so versatile! Tarte Complexion Enhancing Lipstick in Medium – My mom got two Glossyboxes again this month, so I got the darker of the two shades we received. It comes off as a bright mid-tone coral, and I absolutely love it! I TAG ALL OF YOU!! 🙂 It’s a fun tag and I think anyone who wants to do it should go for it (and let me know in the comments so I can go read it)! Thanks for reading! Make sure to check out Marie’s post to see what she chose for her rainbow of beauty products. Thanks, it was a lot of fun!